As a dedication to the memory of Prof. Friedrich Krefter, this page was created with the kind support of his son Dr. Heiko Krefter. The texts and pictures that will be published here from time to time are from the never seen before private collection of the Krefter Family. Dr. Heiko Krefter and his family allowed us to review these materials and publish some of the documents on this website. Friedrich Krefter was born on October 15, 1898. In 1925, he became head of the studio in an architectural firm in Berlin. In the spring of 1928, by an invitation from Ernst Herzfeld, he went to Iran. In Iran, Krefter recorded Herzfeld’s findings through plans and sketches and helped him with the excavation of Pasargadae. Krefter returned to Berlin in October of the same year. 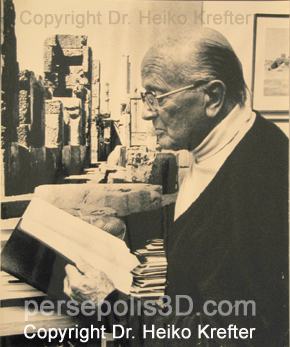 In the spring of 1931, he returned to Iran and until 1934 worked with Herzfeld during the excavation of Persepolis. After Herzfeld’s departure, Krefter stayed and continued the excavation work alone for another year until he was replaced by Erich Schmidt. Krefter then went to Tehran University as professor of history of architecture and stayed for two years. In 1937, he returned to Germany and was drafted into the military. He returned home at the end of the war in 1946. In 1962, an exhibition was displayed at Villa Hügel in Essen in Germany entitled “7000 Years of Art in Iran.” In connection with this exhibition, Krefter met with the head of the recently-founded Tehran Department of the Deutsche Archaeologische Institut and agreed to create the reconstruction drawings of Persepolis. The basis for this work was the excellent documentation of Erich Schmidt, published by the Oriental Institute of the University of Chicago, which also included the documentations obtained from the excavation led by A. Godard. In honor of the coronation celebrations in October of 1967, Krefter was asked to build a model of Persepolis in a 1:200 scale * to be given to H.I.M. the Shahanshah of Iran as a gift on behalf of the German government. Krefter’s book entitled Persepolis – Rekonstruktionen ** was published in 1971. He also built another model of Persepolis in a 1:1000 *** scale which is at the Museum for Pre- and Early History in Berlin, Germany. 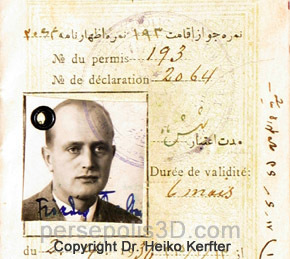 As an experienced architect and knowledgeable scholar in the history of Iranian and Mesopotamian architecture, Friedrich Krefter left a reconstruction model that became the basis of our virtual reconstructions and all other future works. Revisions to Krefter’s reconstruction details will be necessary, because new findings bring new theories, but such revisions will only be in the details. It seems that the substance of Krefter’s work will remain valid. * After the 1979 revolution, this model was damaged and its remains were put in a storage room at Persepolis. ** Vol. 3, Tehran Research of Deutsche Archaeologische Institut, Gebr. Mann Publishing, Berlin (1971). *** This model will be displayed at the Historical Museum of Palatinate at Speyer, Germany, until October 29, 2006.